wraz z krótkim objaśnieniem napisanym przez zawodowego astronoma. 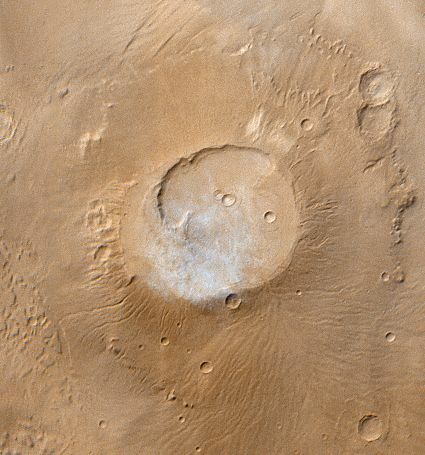 Opis: Dwarfed by Olympus Mons and the other immense shield volcanos on Mars, Apollinaris Patera rises only 3 miles or so into the thin martian atmosphere, but bright water-ice clouds can be still be seen hovering around its summit. Mars' volcanic structures known as "paterae" are not only smaller than its shield volcanos but older as well, with ages estimated to be around 3 billion years. Like Apollinaris Patera, narrow furrows typically extend from their central craters or calderas. It is thought that the paterae represent broad piles of easily eroded volcanic ash. This wide angle view of Apollinaris Patera was recorded last month by the Mars Global Surveyor spacecraft. 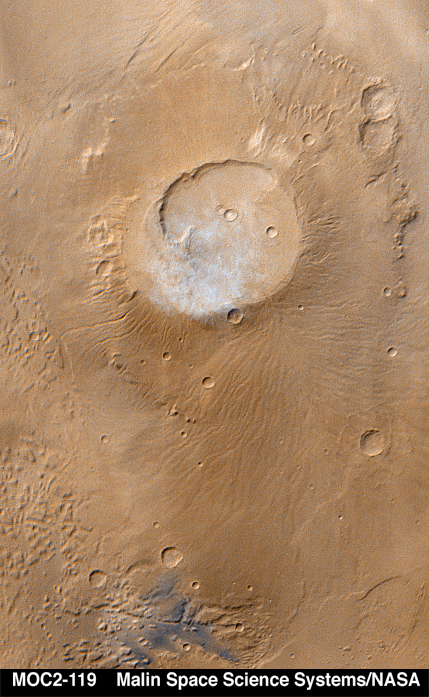 The large central crater is about 50 miles across.